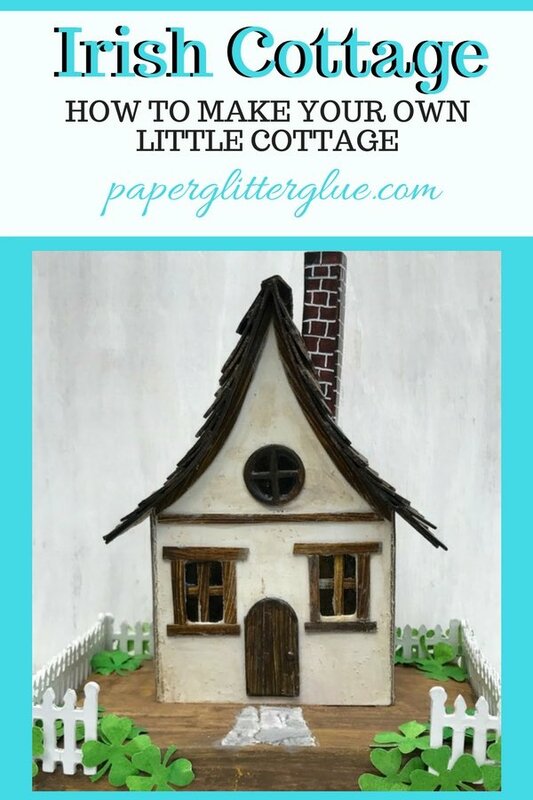 In March I made a St. Patrick’s Day Irish Cottage to celebrate the holiday. I liked the pattern so much that I used the same pattern for the Irish Stone Cottage. 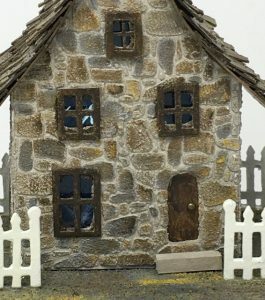 In at least one of those posts, I promised to share a pattern that you could download to make your own Irish Cottage. It took me much longer than I intended, but I finally finished the pattern for the Irish Cottage – meaning that I learned Inkscape enough to finally be able to draw both a PDF and SVG pattern for this little house. Easy when you take it one step at a time. 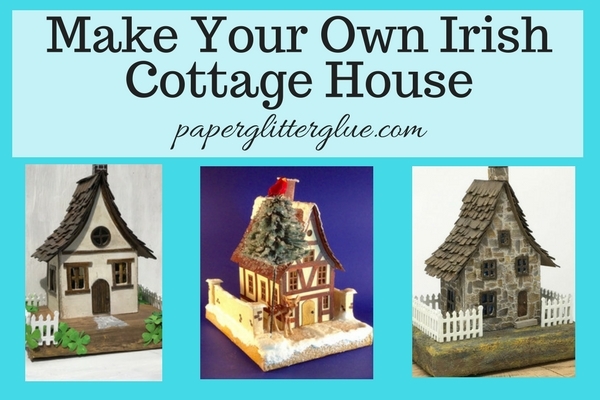 Download the pattern for the Irish Cottage in my resource library. 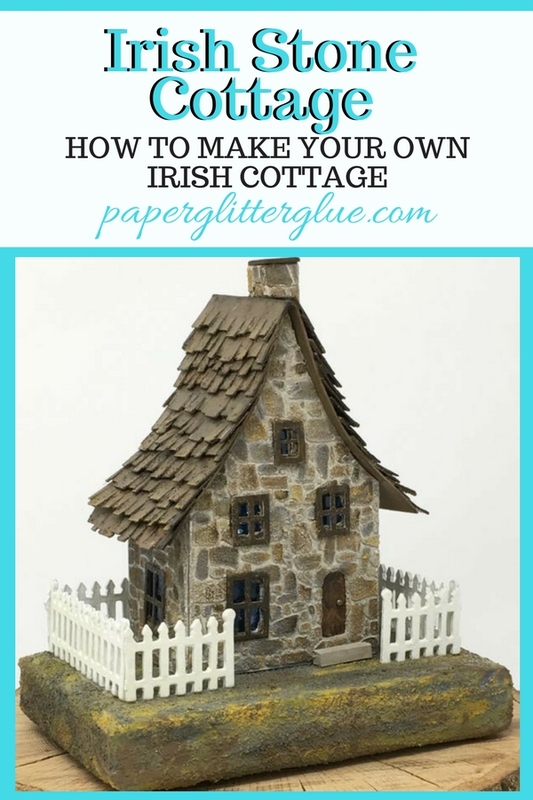 You can subscribe to my newsletter and get the password for my resource library that has the pattern for the Irish Cottage and other free patterns by filling out the form located at the bottom of this post. If you have an automatic cutting machine like a Cricut, then download the pattern to your computer and upload to your design software. Be sure to the mark the red lines as score lines and then attach to your project before you cut. The pattern itself is very simple – it is a basic gable house with a gently curved roofline. I generally make my patterns so they fit on an 8.5 x 11 piece of paper and cardboard. It makes a nice-sized small house. You may shrink or enlarge your pattern to whatever size you want depending on your sources of paper and size of cardboard. Once you have the pattern copied, the score along the fold lines BEFORE you cut it out. It is so much easier to score before you cut because you have a bigger area to hold on to. I don’t always remember to do this, but I always mean to. I did not draw the windows on the house pattern so you can decide exactly where you want the windows placed. One funny thing about a house this size is if you cut out a door in the center and two windows on either side, it just looks like a face. You can see it on the St. Patrick’s Day house. That’s why I offset the door on the Irish Stone Cottage and cut out an extra set of windows. Can you see what I mean that the door and the windows give the impression of face? The doorway was cut out leaving room for a doorstep. Unless you absolutely want a door with a light shining through it or want the door inset, you will find your house much sturdier if you do not cut out the doorway. The house tends to bend and flex with a section cut out near the bottom. And if you do decide to cut out a doorway like I did in the Irish Stone Cottage you will see that I left a strip below the door for support. I think of it as the front doorstep. 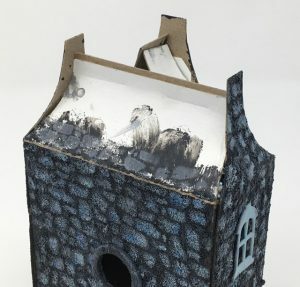 I always prime my houses with gesso (gesso is a white paint which prepares your cardboard to hold onto paint better). For the St. Patrick’s Day house, I mixed the paint with sand to give it a little more texture. You can follow the tutorial linked above to make the stone surface. You also can paint and decorate your little house after you glue it together. That is totally up to you. Confession time – I use window dies for almost all of my window frames. I just don’t like cutting out windows, but I know a lot of putz makers who happily cut them out. Not me. The window dies for the stone house are from Tim Holtz’ Village dwelling series. The ones on the St. Patrick’s house are really just strips of cardboard painted to look like wood. They were easy to cut out actually since you only have to cut out straight lines. If you want your windows to look like they have glass in the panes, cut small sections of clear acetate packaging to function as windows. You can color the window glass with alcohol inks to give them a nice shade. I adhere the windows with a thick transparent glue from Ranger Ink called Glossy Accents. I put a thick layer on the entire window so the windows look like wavy glass. It is easier to adhere windows to the house before you glue the house together. It’s not necessary, but they stick on better if you do. Also I try to paint the inside edge of windows the same color as the window frame. That doesn’t always happen as you can see above. The roof pattern is a little large on purpose. Cut it out and see how it fits, then you can trim the edges if you think they overhang too much. Oh, and before you glue it to the house, paint the underside of the overhang. It looks much better painted a matching color rather than raw cardboard. The chimney piece is the only kind of fiddly piece, really. Remember it is SO much easier to score before you cut the piece out. 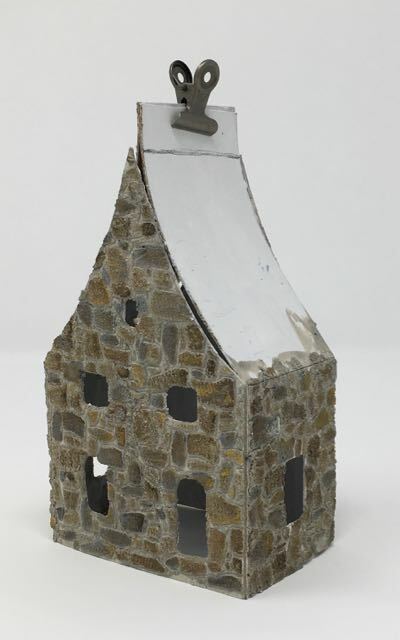 You may notice that the chimney has 5 sides and that is because one of them is the glue tab. You can cut one side a little smaller than the other so it won’t make that side stick out more than the other. I usually draw the mortar lines on the chimney with a white gel pen. You can draw them on before or after you glue the sides together. Mostly I draw the lines after I have it has been glued. I perch the little chimney on the end of one of my fingers and draw away. It’s kind of fun. The little tab on the right side of the pattern is the glue tab. I apply a thick layer of glue and let it get just a little tacky and then adhere the back and side together. Binder clips are a great help in holding the glued sides together. It doesn’t work on the top edge though because the roof flaps for this particular pattern are in the way. You can use one of those brands of painter’s tape that doesn’t pull off your paint or stone texture if you have already applied it. I didn’t use tape on the house above because it would have pulled off the crackle siding on the example above. That means that I just held the top side for a few minutes while the glue was drying. Speaking of roof flaps – what is the purpose of those things anyway? They function as the under roof and give support to the house so it holds its shape better. Curve the roof flaps gently to match the curve of the roof. Clip together. Draw a line so you know how much of the excess cardboard to cut off. The easiest way to glue these in place is to put a line of glue where they meet at the top. Apply the binder clip to hold them together. Let dry. When dry, cut off the excess cardboard, then glue the edge of the roof flaps to the each gable. Now these roof flaps provide good support for the gables. Roof flaps support the gable ends so they don’t flex inward when you glue on the roof. A different house to show you how to glue roof flaps with a curved roof. This house has 2 curves to the roof so the gable ends are supposed to be pushed inward. Be sure the previous pieces you have glued are dry before you glue on the roof. If you use the Aleene’s Fast Grab or Quick Dry glue you do not have to wait nearly as long because these glues are pretty thick. Score the middle of the roof piece and fold it at the scored line. Then gently curve each piece to mimic the curve of the roofline. Smear lots of glue on the roof flaps with a little bit less on near the gable edges. You don’t want the glue smooshing out especially if you have already painted your house. Center the roof over the house (equal overhangs on each side, front and back). Painter’s tape might come in handy here, but normally I hold the roof in place until I am sure it has adhered. Keep watching to make sure you haven’t made the roof slide forward or backward too much. Next step is putting the chimney in place. The curve of the chimney matches the lower part of the house. But really you can slide it allow either side until you like the way it fits. If there is a gap at the bottom of the chimney, you can cover it up with the shingles. 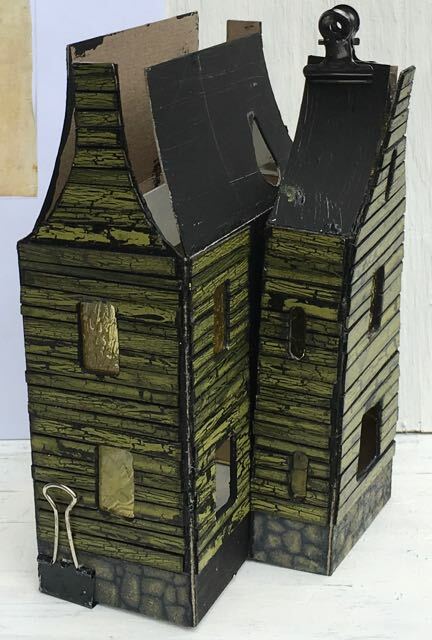 I use lots of glue for the chimney because it takes a little while to get it to hold on a slant and again the shingles will cover up any glue blobs. Apply shingles to your roof. 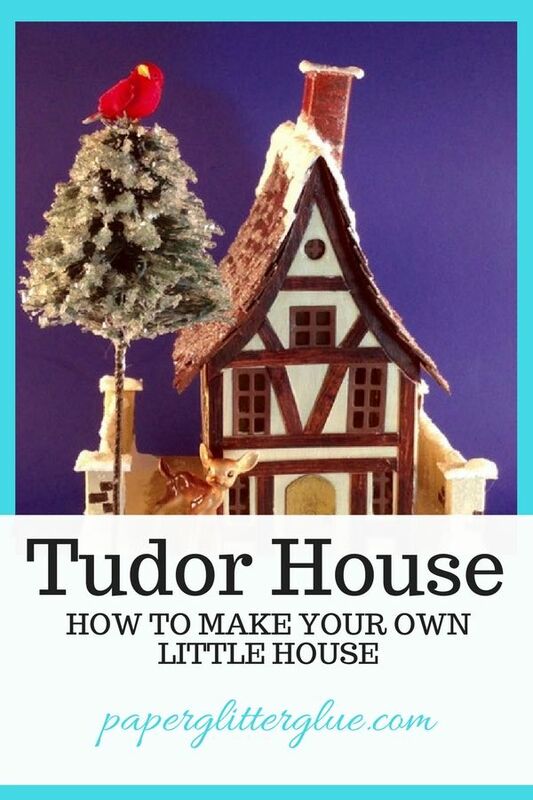 I wrote about applying the shakes to the roof of the St. Patrick’s Day and the Tudor house in those posts if that is the type of roof you would like on your house. 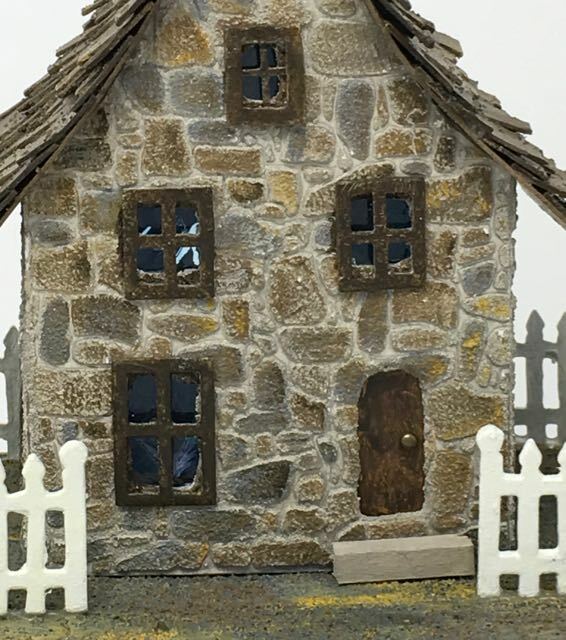 The Stone Cottage has shingles made from Tim Holtz Village rooftops die. But you could cut strips of cardboard to mimic those shingles easily. I make my bases out of corrugated cardboard. Previously, I glued them together with Mod Podge, but now I use a hot glue gun to glue the layers of cardboard together. It’s much faster and easier. It’s the only place I use hot glue. Then I cover the cardboard with paper and paint. Apply a thick bead of glue to the base of your little house, center it over the base and glue it down. I apply a little pressure at first, but I don’t have to hold it long. When I first started making houses, this was the funnest part – decorating the house. Now I enjoy the whole process, but it is still exciting to see the whole project come together. Use whatever embellishments you have on hand to decorate your little house. And have fun in the process. Let me know how your house-making project goes. If you need any additional help, feel free to leave a comment or email me at Lucy@paperglitterglue.com. Feel free to add pins to your favorite pinterest board. Get your free Candy Corn Putz Pattern now! Subscribe to get my newsletter as well as access to this pattern in the library. Once you subscribe, I will send you a newsletter every one to two weeks with details about my new patterns and tips and printables. Success! Now check your email to confirm your subscription to paperglitterglue.com. The password to this library is housekey. Copy and paste or type the password where the resource library requests it. Your email also has the password included. Please know that I will never share your email with anyone and that I will never send you any spam. I will send you an occasional newsletter every 1-2 weeks. You may unsubscribe at any time. Enter my for my latest patterns! The Password is 'housekey' -- please copy and paste that in at the link above. Thanks for being a subscriber!! So many fantastic tips and techniques – it’s really generous of you to share all this and the patterns for your amazing tiny houses. Congrats on the new site – it looks really smart. I just love this house, it has such a whimsical feel to it. I see a fairy house in the future.